Seniors, Zerhow Chan and Michelle Tran, do it again. They designed another fabulous poster to welcome the authors. and simplified them for a very eerie look. One of our sixth graders explains that he has Mayan ancestors. He was outfitted with a microphone so that he could describe his trip to Copan in his father's native Honduras. He regaled the audience with stories of climbing the ruins. The Voelkels have traveled to Mayan ruins in Mexico, Belize and Guatemala, but had not traveled to Honduras. 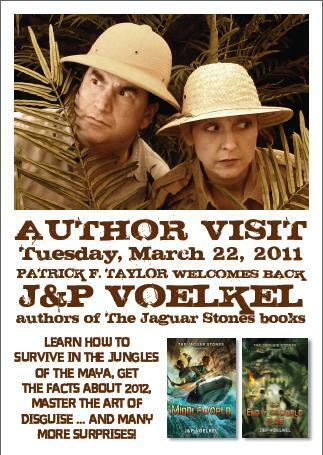 As you can see, the authors were dressed to take us on a trip down to the rain forest. Jon showed us video of some of the interesting things that he got to eat in Mexico: scorpion, termites, worms, and monkey. Sounded delicous, NOT. Then they offered the teachers a chance to taste one of these tasty morsels: fried worms. Believe it a not we all had a thumbs up. At the end of the program the students had an opportunity to get their copies of the books signed by the authors. and Egmont Books in making this visit possible. Summer has hit New Orleans. Right now, I am wishing for a little snow.